It’s February. Time for some deals! Can you believe it is February all ready? What better time than to take advantage of exciting deals on selected Lightsounds products! Highlights include – 1200W active speakers from $299! 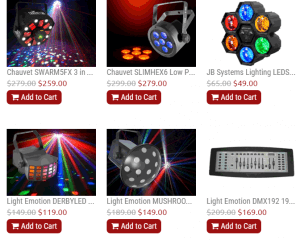 Instant light shows Party Bars and PAR BARS from $449! Smart phone controlled fogger – $299! Studio Monitors, Moving Heads, Disco Lights, Lighting Bags and more – all reduced. Check it out for yourself! Sale runs until midnight Feb 17, 2016. Available online or .